This card has been made for the Splitcoast Stamper’s Way to Use it Challenge – WT321. Don’t you just love this digital image by Digital Delights by Loubyloo? 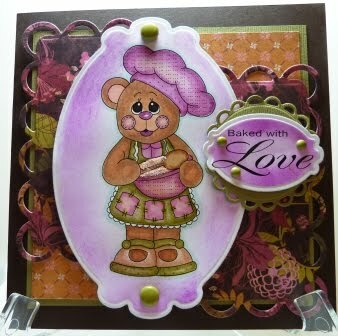 I fell in love with this sweet baker bear! She’s been colored in Copics: C0, C1, E11, E13, E23, E27, E31, E33, E37, R00, R11, R20, RV11, RV55, RV63, RV66, YG91, YG95, YG97 and outlined in BG10. The sponging is Adirondack Wild Plum and done with the image still in the die. I used Tombow adhesive and Stampin’ Up’s Dazzling Diamonds in the bowl for a little bling. The designer paper is from Prima and it’s called Melody. I’ve used the Lacy Square nestie to cut out the floral bg piece. Then I cut it in half and placed it behind the main image. A small Lacy circle has been place behind the sentiment which is on a small Label 10 nestie. A few Bazzill brads have been added randomly to the sentiment and another couple at the top and bottom of the main image panel. Hope your day is sunny and bright! Great card and your colouring is fabulous. Thanks for joining us at Delightful Challenges. Hugs! Don't forget to follow the instructions on the sidebar and enter your card a second time since you have used a Digital Delights image.